Chemical companies and explosive accidents go together. The Solvay Process Company, later a division of Allied Chemical and Dye, had its share of explosions. This one, in 1915, foreshadowed the disastrous 1918 explosion at the Split Rock plant when more than 50 workmen were killed. Fortunately, the following explosion did not take any lives, but it was a reason residents of Solvay and vicinity never completely relaxed. Any loud noise might mean disaster. Eighteen men were injured, two seriously, in a gas explosion last night around 6 o’clock at the newly reconstructed carbolic acid plant of the Semet-Solvay Company. The force of the explosion blew the entire roof from the building, crumbled portions of the walls to powder and shook houses and buildings in Solvay and Syracuse. 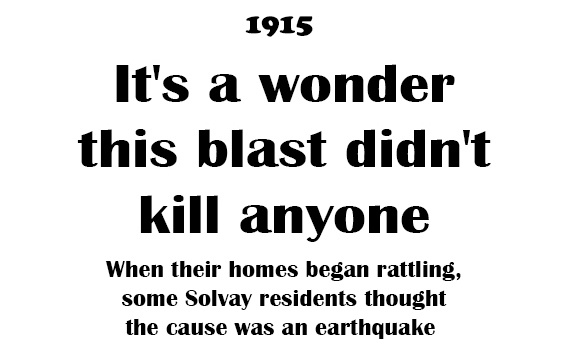 Startled residents immediately called police officials and newspaper offices to find out the extent of life lost and damage done, and thousands of persons poured into Solvay to visit the scene of what they believed would be a frightful disaster. Within ten minutes Dr. R. W. Chaffee and Dr. W. P. Kanar had established a temporary hospital at the Solvay Process police station and every ambulance in Syracuse had been summoned. The work of rescuing men from the building was accomplished rapidly and before 6:30 p.m. every one of the injured had been removed to the station. Eight men, less seriously injured than the others, were sent to St. Joseph Hospital in the hospital ambulance and police patrol. Eight were taken to the Hospital of the Good Shepherd, and two others to Crouse-Irving Hospital. So quickly was first aid applied that at 7:30 p.m. the temporary hospital was cleared of patients and the large crowd which had assembled around the Solvay offices had dispersed. As rapidly as possible relatives of the men who had been at work in the buildings were notified of the condition of the injured. In most cases they were allowed to visit the patients after their removal to hospitals. To the light construction of the building is attributed the fact there was no loss of life. The plant is built of steel, with four-inch walls of brick, which easily gave way before the explosive force. Had the walls been heavy, it was said last night, and the explosion confined within the building, probably none of the workmen would have escaped alive. Officials of the Semet-Solvay Company were unanimous last night in attributing the cause of the explosion to gas which had in all probability escaped through leaks in retorts or containers. They declared that no explosives are used or manufactured in the plant, and that as far as could be ascertained, upon a hasty examination of the place, the sole cause of trouble lay in the formation of an explosive gas of which the workmen were unaware. Whether smoking or sparks ignited the gas or whether it was purely a case of spontaneous combustion, they were unable to state. The carbolic plant was recently reconstructed and manufacture of this acid resumed after a lapse of several years. Machinery and stills used in the process are new and, it was admitted, not completely tested out by time. Probably twenty-five men were at work in the building when the explosion occurred. Of this number, six or seven were uninjured and went to their homes immediately. Of the eighteen who received hospital treatment, but two, Charles Crippen and Patrick O’Neil, were in a serious condition late last night. There is a chance both may recover, although they are badly burned and bruised. The day shift had left the building and the night shift had been working since 4 p.m. In addition to these employees, several repairmen were working overtime in different parts of the structure. Inside the building — which is 65 feet wide, 200 feet long and three stories high — the men were distributed in groups of five or six on different floors. The building is not completely floored and has galleries running the length of the building. Several stills are located near the roof and apparatus of different kinds stretches across the ground floor and through the galleries. It is a peculiar fact that, notwithstanding the force of the explosion, none of this apparatus was destroyed or damaged seriously. In fact, it was said, with a new roof on the building the company would be able to continue operations tomorrow in the same building. The detonation brought hundreds of Solvay residents, wives of employees and fellow workmen of the injured to the plant. Meanwhile a stream of people was pouring across the canal bridge, where a view of the wrecked building could be obtained. Aside from a cloud of dust ascending from the ruins, little could be seen except hurrying men through the company’s yard. The remainder of the immense plant continued operations as though nothing had occurred. In the city, the general belief at first was that an earthquake had taken place. The tremendous force of the explosion can be understood when it is known the shock was felt at Skaneateles, about twenty miles away. Joseph Volinsky, 22, of 305 Lakeview Avenue, was blown through a window by the force of the concussion. He was working on the second floor of the building when the explosion occurred. At Crouse-Irving Hospital last night he said he had no recollection of events immediately preceding the explosion. Volinsky’s injuries are not serious. An X-ray showed no bones broken, but his right arm and shoulder are badly bruised. After Volinsky had become quieted, he declared his experience had been remarkable. He was hurled several feet through the interior of the building and out of a window, landing on railroad tracks several feet from the structure. He arose and started to walk, but took only ten or twelve steps when he was suddenly seized with intense pain. He collapsed and lay on the ground until assistance came. Carelessness on the part of an employee of the Semet-Solvay Company in leaving uncovered a manhole on a vat of benzol, permitting the fumes to escape and become ignited in the fire pots under adjoining stills, was the cause of the mysterious explosion which wrecked the carbolic acid plant of the company on the evening of March 31 and jarred the whole surrounding country, according to a report just made to Commissioner of Labor James M. Lynch by Dr. C. T. Graham-Rogers, director of the Division of Industrial Hygiene. Dr. Graham-Rogers’ report was based on the investigation made by Dr. Vogt, chemical engineer of the Department of Labor; John P. Quigley, fire prevention engineer, and William C. Rogers, second deputy labor commissioner, who came here the day following the explosion. Many recommendations for preventative measures made by Dr. Vogt are heartily endorsed in the report. The light construction of the building, it is argued, saved the lives of the forty or more employees who were engaged in work in the building at the time of the explosion. Although several men were injured, none was seriously hurt. A repetition of the accident is not likely to occur if the recommendations offered in the report are followed by the company, in the belief of the investigators. In June there was a work-related death at the benzol plant. The victim was a man whose job regularly put him at risk. One man met death and another was nearly asphyxiated at the benzol plant of the Solvay Process Company at 10 o’clock this morning. Charles Martin, 29, of 118 Caroline Avenue, was killed while making air pressure readings in a tank and Valentine Cole, 25, of 213 Woods Road, risked his life when he went down in an effort to rescue Martin. Cole sank into unconsciousness when he came out and it required the services of two physicians to revive him. Martin’s wife, a bride of but a few months, became hysterical when informed of her husband’s death. Her condition was such that she was under the care of Dr. W. P. Kanar for some time. The pitiful cries of the bereaved wife could be heard all over the neighborhood. Martin had been employed at the benzol plant for a long time. It was his duty to go down in the tanks, which are about 20 feet deep, and take readings which showed the air pressure present. Fumes in the tank are such that if a an remained down for more than a minute he would be overcome. The tanks are illuminated by electric lights and Martin was supposed to climb down the ladder, get the reading and hurry to the top again. It is thought that he took too much time on this occasion and was overcome. When other employees called to Cole that Martin had now come up, he investigated and saw Martin’s unconscious form in the bottom of the tank, laying in a few inches of benzol. Cole ordered the other men to get a rope and he hurried down the ladder. A rope was quickly lowered and Cole tied it around Martin’s body. However, when Martin as pulled out of the tank he appeared to be dead. Cole climbed the ladder, but collapsed after he reached the top. The company ambulance was summoned and both men were removed to the emergency hospital. Dr. Kanar and Chaffee succeeded in bringing Cole to consciousness, but all efforts to revive Martin were unsuccessful. Martin is survived by his widow, Irene; his parents, Mr. and Mrs. William Martin, and one brother, Frederick Martin. In July there was another explosion at Semet-Solvay. Luckily there were few injuries, none of them serious, but the property damage was more extensive than from the incident earlier in the year. However, the plant that was destroyed turned out to be obsolete and therefore expendable. Circumstances were another indication of how dangerous working conditions were during this period, especially when chemicals were involved. A terrific explosion, believed to have been caused by sparks from a passing railroad engine, destroyed the benzol plant of the Semet-Solvay Company at Solvay at 2:30 o’clock yesterday afternoon. The loss was estimated at $40,000. Five men employed in the building escaped before the explosion occurred. Ross L. Winchell, core maker, 209 Sixth Street, and John C. Kanar, engineer, 1011 Milton Avenue, Solvay, were injured fighting the fire that followed the blast. A fireman in the cab of the engine supposed to have caused the explosion, was struck on one hand by a flying fragment from the wrecked building. The building, constructed of steel and iron, is a mass of twisted metal, inside of which a fierce, stubborn fire burned steadily all night while streams from nine lines of hose were poured into it. The building is next to the large coke manufacturing plant, which, it was feared during the early stage of the fire, would be destroyed. The benzol plant was a sheet iron shell about 75 feet high and reinforced with steel girders and supports. It contained besides other oil refining machinery, five large steel columns, or tanks, each containing between 700 and 800 gallons of oil. There is a vent pipe leading through the roof of the building and, according to the theory advanced by officials, the sparks ignited the vapor from this pipe. The explosion was heard in all parts of Solvay and the shock was felt in all buildings nearby. The upper part of the structure was blown over toward the roadway and great sheets of iron were partly ripped off the girders and string pieces. It is believed that the peculiar construction of the building prevented large fragments from being blown off the building, and the mass of iron and steel crumpled up into a shapeless pile. The fact that the employees in the building escaped is due to a warning given by George Townsend, foreman,, who saw what is described by men who know the plant as a signal light and shouted to the men to run. They had just reached the street when the explosion occurred. Flames from the burning benzol shot up 60 feet or more. The Solvay company’s fire brigade responded immediately to the alarm, and every available piece of hose was put into commission. As it was apparent that this force would not be adequate, the volunteer fire department of the village was summoned. With the fire burning fiercely in the building and apparently unaffected by the torrents of water poured upon it, there was immediate danger of the other four tanks exploding. Men working on the fire said these tanks were opened and the benzol allowed to run out, increasing the blaze, but preventing any possibility of an explosion. When the water was turned into the building, clouds of black smoke enveloped the building and the firemen. At different periods this smoke was so dense that the plant, railroad track and roadway for a radius of several hundred feet were hidden. It was while the firemen were trying to get at the fire from every possible angle that Winchell and Kanar were injured. A piece of glass struck Kanar on the right arm, and almost at the same time Winchell was knocked from a ladder by a falling hose and his right leg injured. Both men were taken to the railroad signal house nearby and Dr. William P. Kanar dressed these injuries, after which the two men were taken home. H. H. S. Handy, vice-president of the company, made a statement in which he said that within 10 days the building would have been abandoned and the benzol plant removed to a new structure being erected on the north side of the Erie Canal. “This building,” said Mr. Handy, “was the old oil refining plant which has been in use about 15 years and has never been satisfactory. “A hasty investigation leads us to believe that a spark from a passing locomotive ignited the vapor from the vent pipe and the fire started in the roof of the building. This spread to benzol drippings from the outlets in the tanks. We have never had a fire of this kind before." Sparks from a passing locomotive ignited benzol from an overflowing tank and caused the explosion and fire which destroyed the benzol plant of the Semet-Solvay Company last Wednesday, according to a report just submitted by John P. Quigley, fire prevention engineer of the State Industrial Board. According to the report which Mr. Quigley has forwarded to Albany, the investigation showed that an employee misgauged the capacity of one of the tanks in which benzol was stored and that it overflowed. The fluid ran over the ground and collected between the tracks of the company’s private railway at a place close to the plant in question. As the small locomotive passed over this place, a cinder fell from the firebox and ignited the fluid. The burning benzol then followed a trail to the tank, causing the explosion and fire, in Mr. Quigley’s belief. There was yet another explosion at a Semet-Solvay plant, this one in December, but the resulting fire was small and easily contained. Flames caused by a slight explosion in the coal tar products plant of the Semet-Solvay Company broke out at 8:30 a.m. today. The company’s fire department and the Prospect Hose Company responded to the alarm. There was little damage.